I must be getting old if I actually thought this was a good idea. I mean, only old people like bingo, right? At any rate, I came up with the idea yesterday at work (but I bet others already beat me to the punch. I’m too afraid to even look up “anime bingo” after what happened with Anime Tinder). Shown below are some of the things that come to my mind whenever I imagine someone is watching anime. 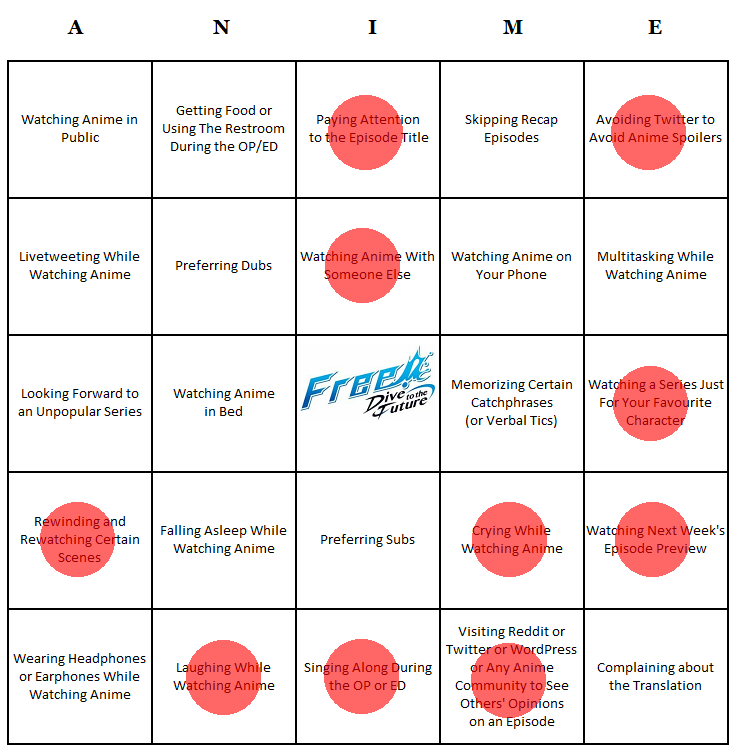 Personally speaking, I’ve done a lot of the mentioned activities in this Watching Anime Bingo! What about you? Aaah… no bingo for me! That was fun to think about. There are only four things on the card I’ve never done, but they’re spaced out widely enough that I only have three actual bingos: row 4, row 5, and column 3. Ahhh, that’s still quite a lot of bingos! Thanks for playing! Oooh looking forward to it! ive done…all of these except “cry while watching anime”…how? So I used a website to generate a 5×5 table since I wasn’t thinking properly at 3 in the morning. I imagine you can make a similar table via google docs or Word or something. I provided 25 terms or phrases in the textbox “List of Words” and then clicked generate. This method was nice since it randomly assigns boxes for the phrases, but I still had to move some around. Since I don’t know really know how to use widgets and such on WordPress, I just took a pic of the bingo table/card using window key+shift+s, pasted it into MS Paint, then uploaded the file. The Free joke is absolute gold! I think when people make bingo boards for anime (including something I did back in February), it’s about tropes within anime and not the meta stuff…so I think you’re safe enough.